Here are some photo sets I (and friends) have taken over the years. Of the theaters shown here I believe the only ones that still remain standing (in various states of disrepair) are the Meadowbrook in Fort Worth, Texas, the Paris, Texas Drive-in, the Bonham, Texas Drive-in sign and possibly the two in Waco, Texas. Click on the thumbnail images at left to view the page for each drive-in theater. 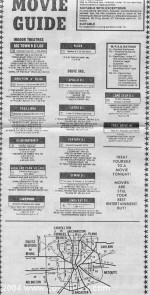 Dallas Morning News Movie Guide From The Mid-1980s. 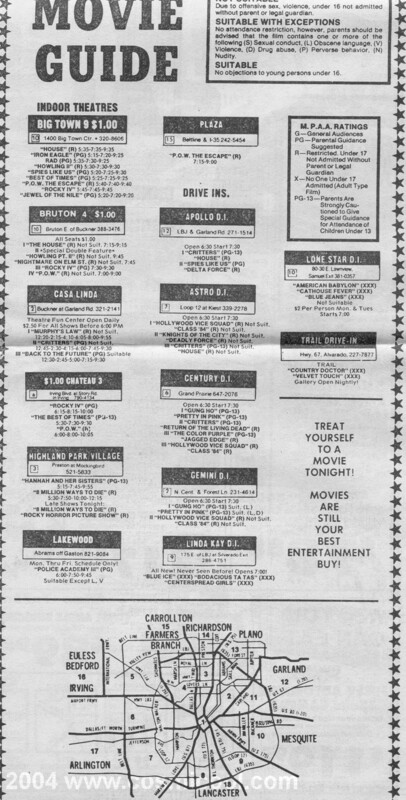 Here is a scan of a page from the Dallas Morning New Weekend Guide movie listing. I didn't remember that many drive-ins still around in in the Dallas area at the time, but there they are. Click the thumbnail to see the full size image. Full size image 500Kb.